On Saturday night, John Matteson, 29, and an unidentified suspect tried to enter a Simi Valley mosque, claiming they needed to use the bathroom, mosque members said. The worshippers were closing mosque for the night at the time. A verbal argument began and then turned into a fight. 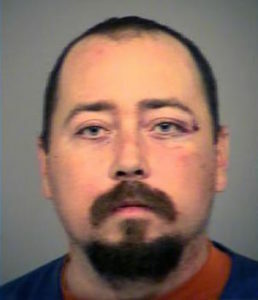 Matteson, a Simi Valley resident, allegedly stabbed a 36-year-old man in the abdomen during the fight. Around 11:15 p.m., Simi Valley police officers responded to the rear of a shopping center and separated a group of people who were fighting. Officers arrested Matteson, but the second suspect fled by foot and evaded capture. Police say it appears, based on Matteson’s statements and actions, that he targeted the victim because of his religious background. “We’re looking into perhaps the way our victim was dressed and his association with the local mosque,” Simi Valley police Sgt. Adam Darough said. Numerous witnesses saw the incident, police say. An investigation into the incident is ongoing. Officers booked Matteson in jail with his bail set at $25,000. Matteson is reported to have had previous run-ins with the law. Sniff… sniff… Is that narrative in the air that I smell? Then again, I’m the kind of person who would think that any stabbing is a hate crime, but what do I know of victimology, perceived or otherwise? I’ve seen higher bail for traffic incidents. Must be the “white privileged” I’ve read about.